Last week I reviewed three new natural perfumes from Providence Perfume Co: Rose 802, Orange Blossom Honey and Summer Yuzu. This week I have some brief thoughts on the other three, all of which are similarly light-hearted and wearable. They also have fun sources of inspiration. Ivy Tower might, I'm guessing, be a play-on-words evoking the academic "ivory towers" of Providence's own Ivy League institution, Brown University. In any case, it's billed as "a delicate green floral evocative of a rain soaked path through the ivy," and that's a perfect description. Ivy Tower's composition includes narcissus, mimosa, blue tansy, lily, sandalwood, geranium, jonquil and jasmine. It opens with dewy green foliage (and a minty edge of geranium leaf) and gradually blooms into some lightly peppery narcissus and a clean lily note. The dry down is delicately musky, like a suggestion of the earth under the flowers and vines. (If you like Annick Goutal Eau de Camille, you may like Ivy Tower too.) This is an ideal spring scent, but it shouldn't be saved just for spring. Sweet Jasmine Brown is a tribute to the jazz standard "Sweet Georgia Brown" and a "sassy" composition with notes of jasmine, vanilla, pink pepper, tonka, cocoa nib, ylang ylang and musk ambrette. If you like your white florals sweet, you might want to check out this one. The jasmine heart smells as though it had been sprinkled with brown sugar and a few drops of caramel. The musky ambrette base reminds me of other fragrances in the Providence Perfume line — Divine, for one. Something about this accord in combination with the white florals bothers me a bit. but that's just a matter of taste. If you're a Divine fan, you should try Sweet Jasmine Brown too. Violet Beauregarde is named for a character in Roald Dahl's Charlie and the Chocolate Factory and is a "sheer violet floral" with notes of ylang ylang, violet leaf, alpha ionone, vanilla, sandalwood, mimosa and jasmine. Providence Perfume notes that ylang ylang is sometimes used to flavor bubble gum, which fits Miss Beauregarde's profile perfectly. Here, the ylang ylang is creamy and slightly rubbery, with an interesting mentholated aspect. The violet note is candied and a bit powdery. As in Ivy Tower, the jasmine is very subdued. The vanilla comes out to play for a bit, but the minty-menthol ylang ylang keeps it (and the violet) from turning dessert-y. This scent is a bit of an oddball, but I like it. These three oils have moderate staying power for natural perfumes. As a group, they lean more feminine than last week's Orange Blossom Honey or Summer Yuzu, but Ivy Tower in particular could easily be worn by a man. I'm assuming that this collection is intended as a "gateway" line for customers who might be new to natural perfumery, or even niche/independent perfumery in general; these fragrances didn't turn out to be as light and simple as I expected, however (a good thing! ), so they're unusual enough to appeal to veteran indie-scent consumers as well. 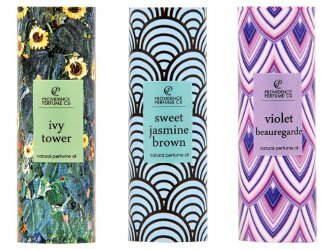 Providence Perfume Co Ivy Tower, Sweet Jasmine Brown and Violet Beauregarde are $50 each for a 5 ml Perfume Oil rollerball. A sample set is also available. For purchasing information, see the listing for Providence Perfume Co under Perfume Houses. Thank you for the reviews. None of these sound like my cup of tea, but I admit I am disappointed that the Violet Beauregarde doesn’t have a blueberry note. I was disappointed to see that, too. I’ve been wanting to sample some fragrances from Providence Perfume Company at their brick-and-mortar location, but it slipped my mind last time I was in RI. Your review of Ivy Tower has made me doubly motivated – I’m a Brown grad and a lover of ‘green’ scents, so I’ll definitely seek it out! hah! It’s a very, very nice natural green fragrance. The “ivy” thing is just my guess… but why not. Eh, even if it’s an inadvertent homage, that’s good enough for me! The Ivy Tower sounds appealing. It is awfully fun to say! — and it *is* a major player in this fragrance. At least there are many other great violet scents out there for you! Sweet Jasmine Brown sounds intriguing. And I need to get a bottle of Ivy Tower for my daughter whose name is Ivy and who happily reminds me every day how much closer she is to towering over me… And she’s only twelve. She’d definitely enjoy the humor and quite likely the perfume as well. We like to find perfumes that have her name somewhere in the fragrance name (especially since she doesn’t know anyone else with her name) and this looks like a good one. What a pretty name! I hope Ivy enjoys her Ivy Tower. What fun! Perfect. I hope she loves it! and it’s not too heavy for a younger lady.